Through the protection of life, property and the environment, Edmonton Fire Rescue Services improves the livability of all Edmontonians. The provision of internationally-recognized front-line fire rescue services, fire prevention programs and public education make the city a safer and healthier place. Any fire or explosion that results in property damage, injury, or death will be thoroughly investigated by the fire investigations team to determine the origin, cause and circumstances of in the fire. When required, Fire Investigators will consult experts from other city departments, government agencies and private organizations to determine the cause of fires. Each incident that the team responds to is assigned an incident number, and is detailed in a report that can highlight recurring problems. Through the City’s Quality Management Plan (QMP), Fire Prevention Officers are also charged with conducting an average of 16,000 inspections each year to ensure buildings in the city of Edmonton are in compliance with the Alberta Fire Code. The QMP also includes all other requests for services, which may include shut off notices, fire drills, business licences, occupant load calculations and Fire Safety Plan reviews. Venues convicted of Alberta Fire Code infractions can be found on the Fire Code Convictions page. Visit Fees and Permits for more information. Please note that City of Edmonton bylaw and provincial regulations may affect issuance of all permits. Within this division, Fire Prevention Officers oversee new construction, interior and exterior inspections, demolition, as well as fuel tank installation, removal and permits. They also review development permits and construction site Fire Safety Plans. The city is divided into several different geographical work areas. District Inspectors carry out the thousands of inspections within the Quality Management Plan in their assigned work area, as well as false alarms, business licences and occupant load calculations. 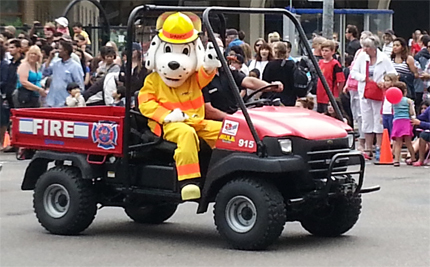 These Fire Prevention Officers assist City of Edmonton event staff in ensuring all events within the city limits meet Fire Safety Regulations. Knowledge sharing is a valuable tool in enhancing fire prevention. Through lectures, Fire Prevention Officers educate the public on the dangers of neglecting fire hazards. Lecture requests are reviewed by these Officers to best determine if the requests meet current criteria.